Widely regarded as the epitomy of sartorial elegance, Big Hamish has singlehandedly raised the international reputation of Lidl in the fashion stakes. Following the debut of his new footwear range, no doubt the F1 pit lane glitterati will be beating a path to Lidl's doors before they sell out. 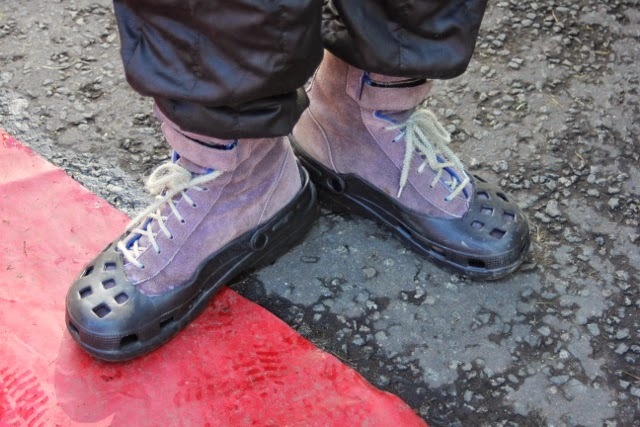 In a fit of stylistic brilliance, Hamish used his Boy Scout training and Swiss army knife to fashion a pair of galoshes for his suede race bootees to protect them from inclement weather when outside his thoroughbred rally machine. All he needs now is a lackey to help slip them on when he stops the car and pull them off when he climbs aboard to take the wheel. Seriously, he bought a pair of plastic sandals and cut the tops off them to turn them into protective slip-on overshoes. The simple ideas are always the best, eh? Nice one Hamish.